PortaFab shelters can be outfitted with many options to enhance functionality and comfort. Cigarette Urn & Ash Trays - Wall- or floor-mounted ashtrays and urns minimize litter. Radiant Heater - Ceiling-mounted radiant heaters feature powder-coated steel enclosures, gold anodized reflector, and push-button timers. Exhaust Fans / Ventilation Systems - Exhaust fans & air purifiers are ideal for removing smoke in smoking shelter applications. Benches - Choose from wooden or maintenance-free, clear anodized aluminum benches. 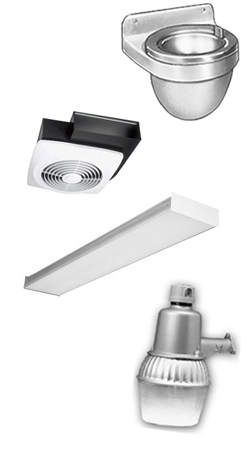 Fluorescent Fixtures - 4' long, ceiling-mounted, energy efficient, industrial fluorescent fixtures with acrylic lenses are suitable for environments where weathering, high temperature, humidity, dust or corrosive fumes are present. Wind Skirt - Seals shelter to the concrete. Window Glazing - Bronze tint glass, acrylic or polycarbonate. Specialty Lighting - Photocell-activated, dusk-to-dawn lighting is ideal for shuttle stations, bus stops and other mass transit shelter locations.